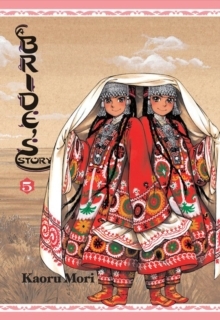 Acclaimed creator Kaoru Mori's tale of life on the nineteenth-century Silk Road takes on an air of celebration as, at long last, Laila and Leily's wedding day arrives! But the marriage ceremony may be even more taxing for the girls than their search for a pair of grooms. Sitting still and silent as their guests celebrate and eat is a trial that will push the girls' patience to its limit, not to mention that of Sami and Sarm! As the twins finally make their vows and commit themselves to their husbands, the gravity of the moment finally sets in. Though they have dreamed of marriage for years, only now do they realize that everything in their lives is about to change...Crafted in painstaking detail, Ms. Mori's pen breathes life into the scenery and architecture of the period in this heart-warming, slice-of-life tale that is at once wholly exotic, yet familiar and accessible through the everyday lives of the characters she has created.